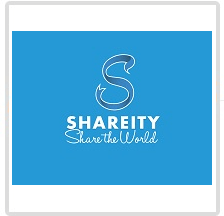 Shareity - Boston GreenFest - Aug. 16-18, 2019 - FREE! Inspiring citizens to use their social influence to shine a light on every dollar that is donated world wide. Our socially conscious platform ignites the power of humanity, IT DECLARES YOU MATTER! By elevating the consciousness through action, we aspire to create a world of healthy and happy people & flourishing planet; one dollar and one action at a time.